Dan and Lindsay McKenzie met and fell in love while attending Colorado State University, married in 2010 and have been living a life of which many people only dream ever since. Soon after their wedding, this adventurous couple lived and traveled in Central America for a few months, living in Quepos, Costa Rica, and backpacking around Panama. They had such a great time exploring there that in 2013 they took the money they had been saving for a down payment on a house and instead traveled to Europe. 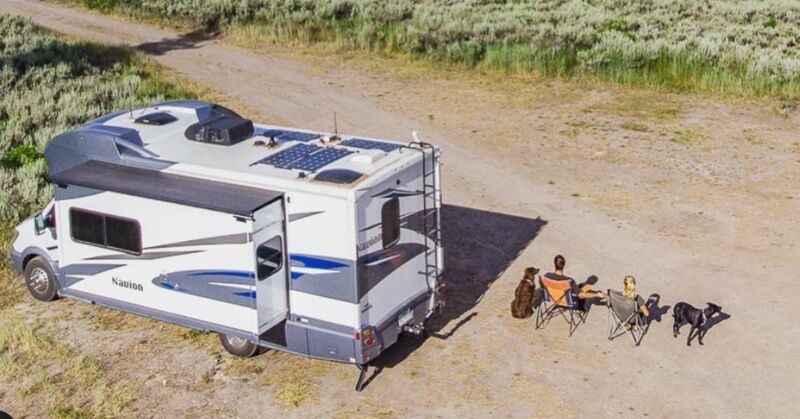 The duo continued to travel internationally for several years before returning to the United States to live a full-time, nomadic, RV lifestyle, exploring their home country along with their two dogs, Kyla and Pepper. These two know a lot about travel, living on a budget, adventure and life. Lindsay and Dan began their blog, FollowYourDetour.com, to help inspire others to live their best life too. In it, they offer tips about finances, travel recommendations and tales of their journeys. 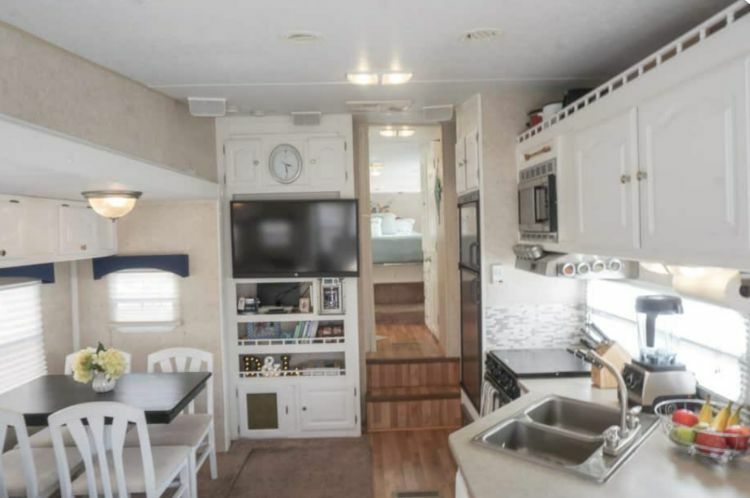 Although they began their RV lifestyle in a 2018 Winnebago Navion motorhome, they soon graduated and upgraded to a larger, fifth wheel trailer. 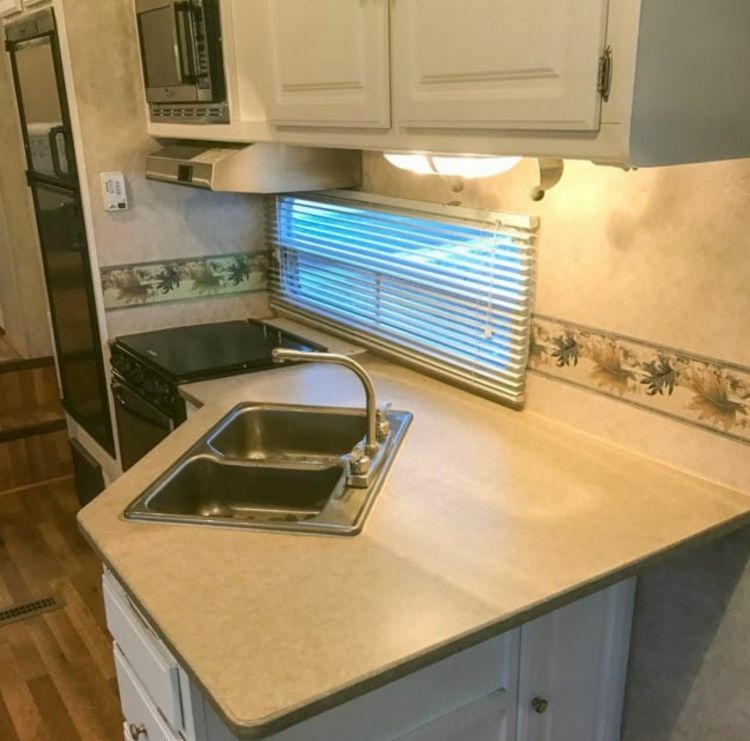 They bought a 2005 Forest River Rockwood trailer, and even though it was in good shape, the interior was outdated and needed work. Dan and Lindsay took on this challenge with gusto and managed to make their new home look beautiful and modern for only $500. Their first project was to replace some of the furniture. Although it was comfortable, it was ugly and heavy. 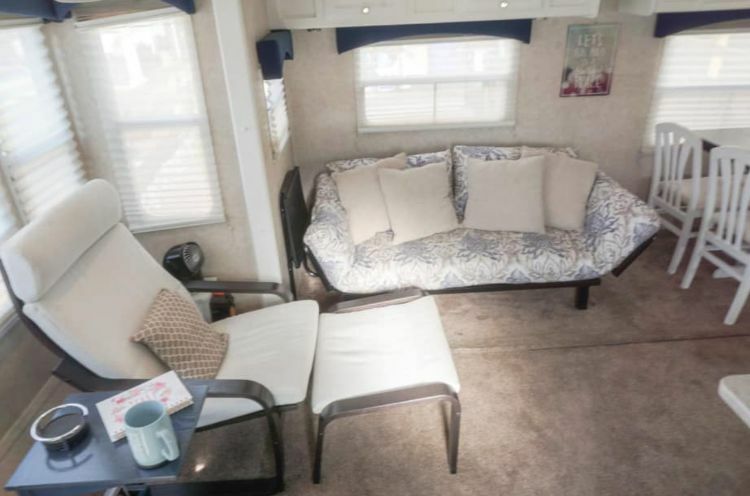 The couple believed that weight could be used better elsewhere, so they got rid of the couch and recliners, and brought in simpler, more lightweight furniture that looks better too. 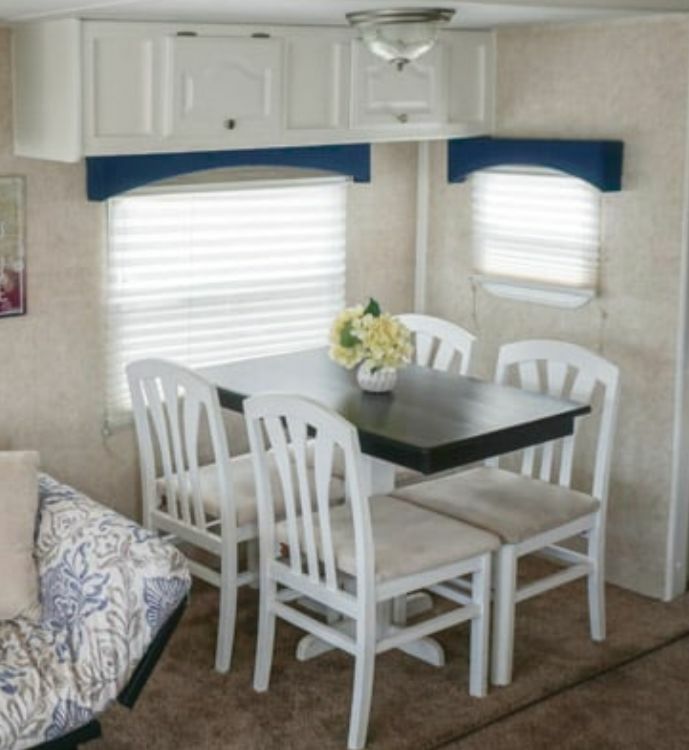 Just this one simple change already had their fifth wheel trailer looking years younger. 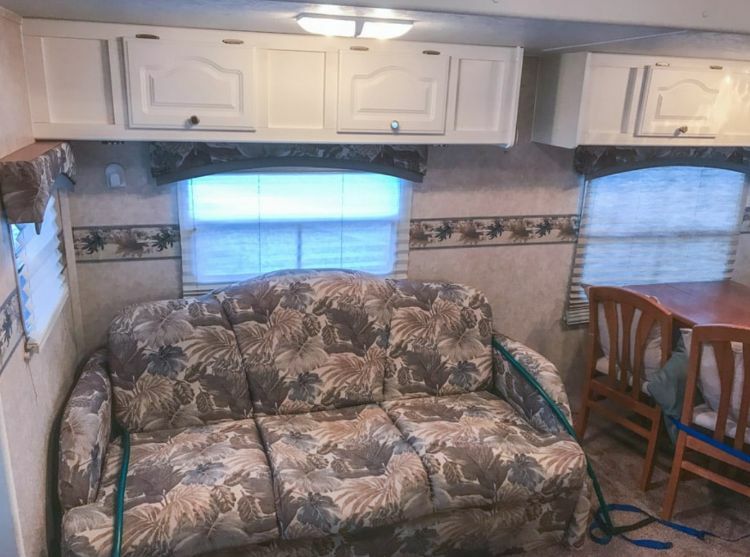 They replaced the couch with a futon they found secondhand online. This was an excellent move for the McKenzies for two main reasons. This foldable, convertible furniture allows them to host guests and offers space underneath for storage — space not available to them with the older couch. What a difference! The couch was rather unattractive and took up much more space. Lindsay and Dan also removed the wallpaper border above the couch. It matched the couch, so once the couch was gone, there was no reason to keep it. 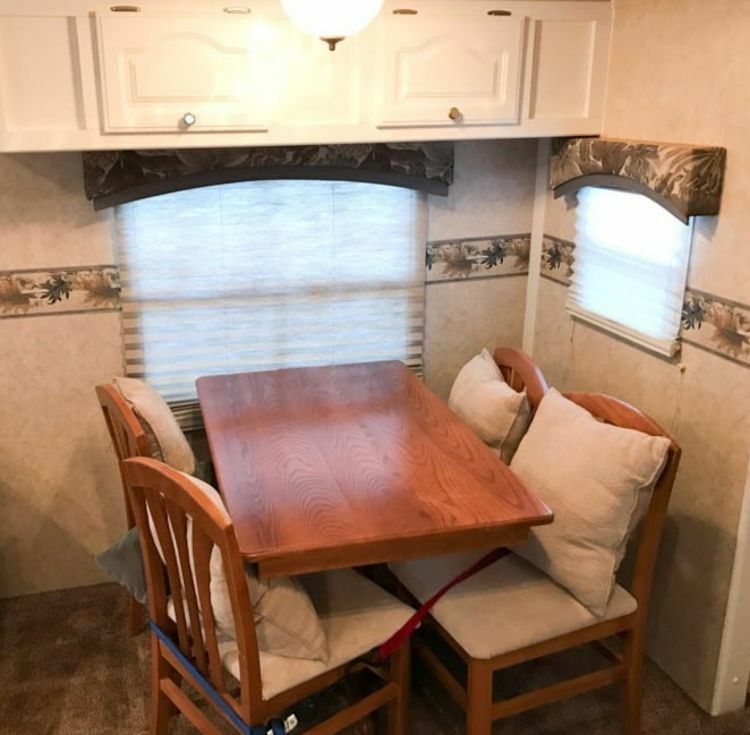 Another change this couple made to update their trailer had a much bigger effect than anyone would expect: They painted the dining room table and chairs. This does not seem like a major change, but look at the difference. When the wood grain was visible, this set looked worn out and out of style, really showing the age of the RV. Who would ever guess that just a few coats of paint would make it look new again? One thing that can really make a trailer show its years is the original fabric. The McKenzies decided to recover some of the valances and remove others entirely. In the bedroom, they took them down and put up blackout curtains to improve their quality of sleep. 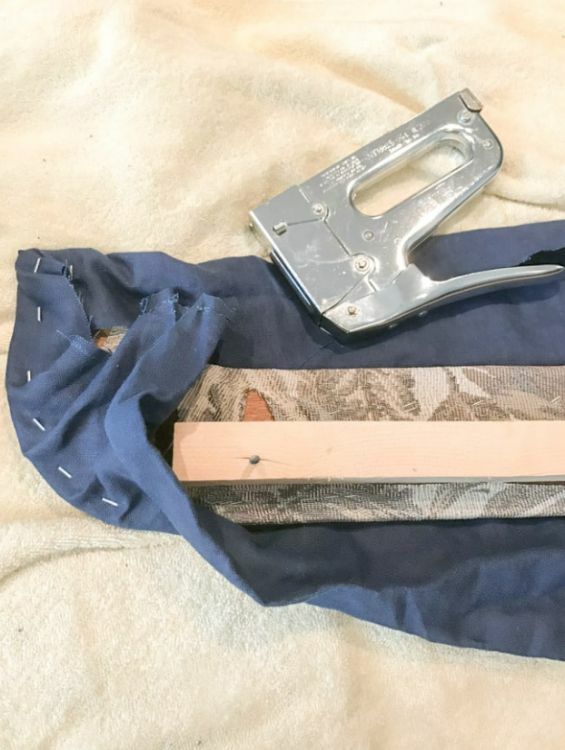 In the living area, they took the valances down and covered the unattractive pattern with plain, royal blue fabric using a staple gun before reinstalling them. 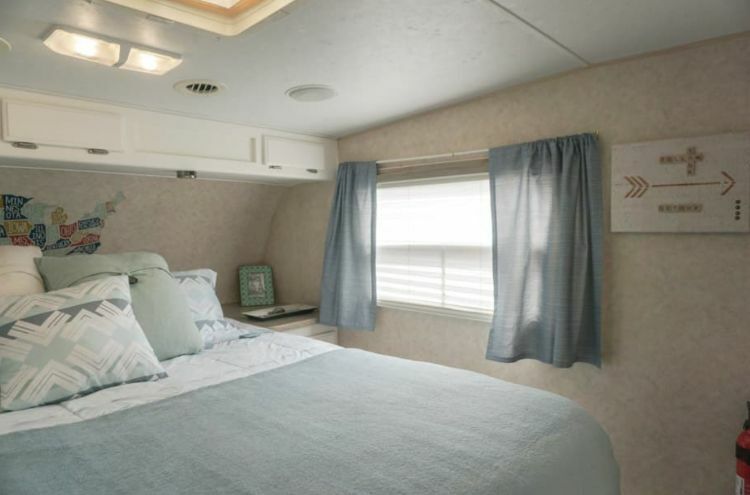 The blue valances beautifully accented the RV's overall look. Dan and Lindsay also made no-sew pillow covers to round out the feel of the room. Another impressive addition to the main living space is a new backsplash. Before the pair added this feature, the kitchen looked dark and drab. 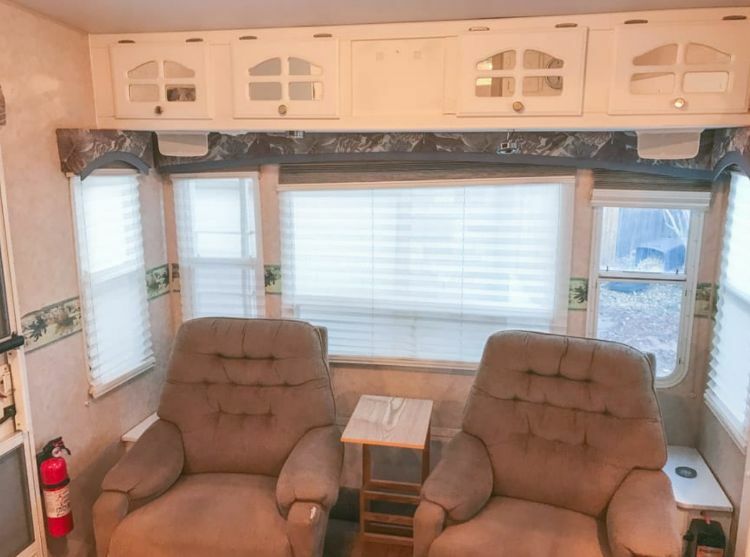 The wallpaper border certainly did not help. The new backsplash looks sleek and fresh. Incredibly, it is just peel and stick adhesive, and the McKenzies installed it themselves in about an hour. It really helped to improve the look of the kitchen and was so simple and affordable. Finally, Lindsay and Dan added accent pieces. 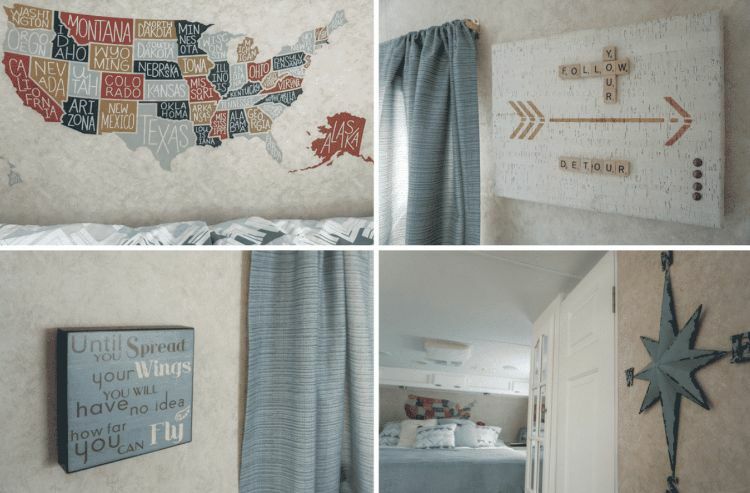 Although this sort of decor can be a hassle on the road because it often falls down when traveling, the couple says it is worth it to put it back up time and time again. 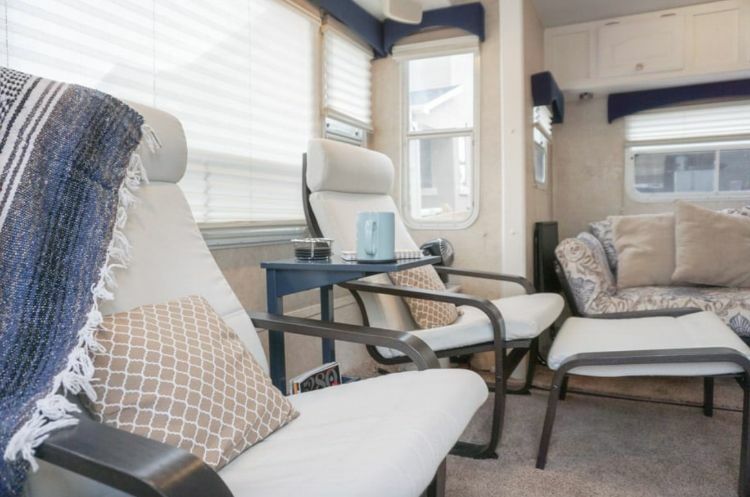 It allows them to express a bit more about their personalities, and really helps to make the space feel more like home than like a trailer. 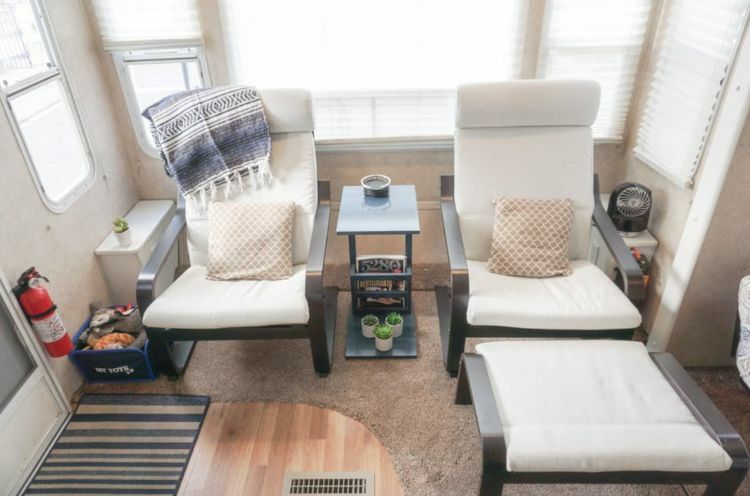 With just these few small, easy, affordable changes, Dan and Lindsay have created a wonderful, updated, clean and modern space they can call home, no matter where they park. 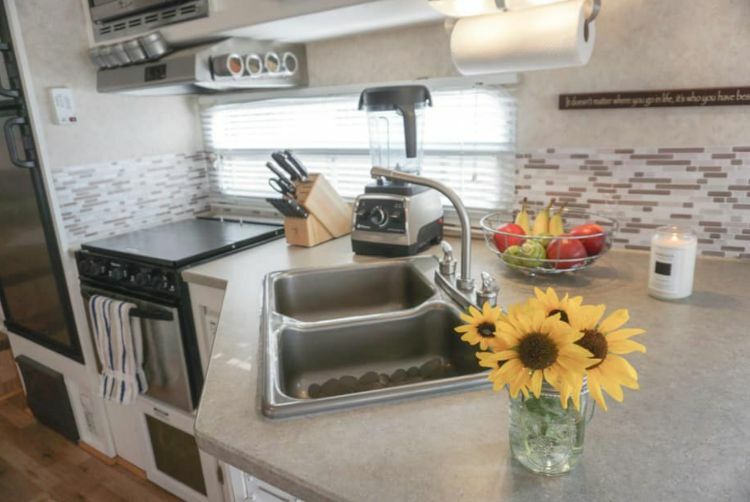 Their renovation is exciting and inspiring, and they hope their ideas and changes can help others to update their own trailers.